Daily brushing of the teeth and interdental cleaning help us keep the health of our teeth and gums, and reduces the chance of developing cavities or gum disease. It is recommended that you brush your teeth 2 to 3 times a day, spending at least two minutes at it every time. Using a medium brush, not too hard not too soft, will help to clean correctly the surface of our teeth. If the brush is too soft we may not properly brush away the microbial plaque, whereas if the brush is too hard, the gum might be harmed or we may cause recessions of the gumline with an erosion of the dental necks. 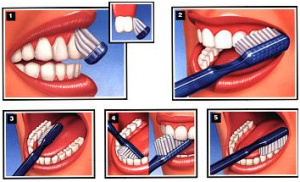 Therefore it is really important to use an adequate toothbrush with the correct brushing technique and to replace the brush every three months. During the oral hygiene appointment, besides eliminating tartar, spots and surface polishing your teeth, we will teach you the most appropriate brushing techniques as well as the proper use of interdental hygiene elements, as interdental brushes or floss, depending on each patient. We might also indicate the use of water jets (specially in patients wearing implants) and tongue scrapers.